Your Source for the Lastest IDW Sonic News and Info! It is that time again for perhaps my favorite article of the month, the sales breakdown! July was a big month for IDW Sonic, marking the beginning of the second half of its first year in publication. IDW broke out all the stops for this one, 6 different gold-stamped covers, half of which served as promotional material at San Diego Comic Con. However, even without those numbers, the book did splendidly, and orders increased for the 2nd month in a row, this time significantly! Remember! These numbers which I obtained from Comichron only represent the number of books ordered by stores from Diamond. Typically, this represents the number of A and B covers ordered and excludes retailer incentives, digital sales, and convention exclusives. Likewise, this does not represent how many books were bought by actual customers, just how many retailers ordered. Essentially, it represents how much demand retailers feel they have for a given title. If they buy more, it indicates that customers want it; if they buy less it indicates that they do not! Now then, let us get into the numbers! As I mentioned, orders have increased for the 2nd consecutive month! While June saw an increase of just under 500 copies, July saw an increase of over 1,000 from the previous month! That is an 8.9% increase in orders in July to June’s 3.8%, more than double! With 14,203 copies, ordered for #7, IDW Sonic has officially sold over 100,000 copies since launch in April! 111,883 have been ordered, not including sales for RE variants, digital sales, or convention exclusives! 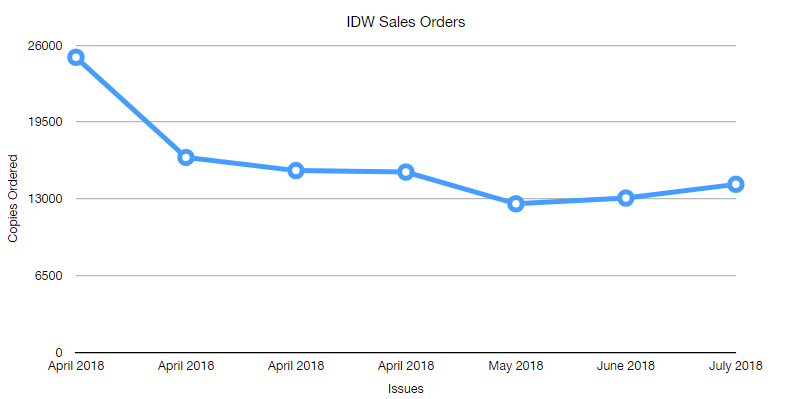 Issue #7 brings the average monthly orders to 15,984, which indicates that despite 2 months of increased sales, the numbers are still normalizing from April’s hugely successful launch. While not quite on par with those issues, I expected it to sell out and for us to see a reprint in the near future. However, this may be due to retailers having better gauged demand for the book after a few issues. I should note that the above chart includes reprint sales. Thus far only issue #1-4 have had reprints. Interestingly, when you compare the debut orders of each book, issue #7 performed better than issues #3-6! This gives #7 the 3rd best debut sales, yet still falling short of #1 by over 7400 copies! While quite nearly on par with those issues, I expected it to sell out and for us to see a reprint in the near future. However, this may be due to retailers having better gauged demand for the book after a few issues. If we do see a reprint, it may very well shoot up the list. Stacking up against other Sonic comics of days-gone-by, issue #7 did pretty well. As I predicted, having already dominated the Top 10 chart, IDW Sonic will start bumping its own issues off the list. While Archie Sonic #275 & #251 got displaced by IDW #7 taking the #7 spot, IDW #6 also got bumped down a peg, and #5 became the first IDW book to be knocked off the list. This leaves IDW with 6 of the 10 spots still, albeit, in significantly better standing. In the coming months I expect the two lower Archie books to fall off the chart, but #250 and especially Boom #1 will be a difficult challenge for IDW to meet! Compared to other IDW titles, Sonic continues to be a strong performer out of the gate. It was the 2nd highest selling IDW title for July after the debut of issue #1 of Moore’s grand finale to the League of Extraordinary Gentlemen, The Tempest. Besides that it outpaced IDW’s other top names like TMNT, Transformers, and Star Wars by 1,000s of copies! In the larger comic world, Sonic the Hedgehog came in 139th for units sold and 124th for dollar sales, both strong positions for an indie publisher. The bump in orders for issue #7 is encouraging and likely has several explanations. The first being the treatment this issue got. IDW treated it like a milestone issue, celebrating the second half of the first year of the book. For some this, might seem a bit early to celebrate, but the fanbase embraced it. Likewise, issue #7 featured a first for Sonic comics, a gold stamped title that only added to the pomp and circumstance. But what really made this issue special was the phenomenal writing that has hooked readers and ushered them along for 7 issues to the big reveal of Neo Metal Sonic! Flynn continues to knock it out of the park with his writing and is surrounded by equally talented artists. They have truly built a book by the fans for the fans, and thus the fans are embracing it. I am eagerly looking forward to seeing if August’s order numbers hold up. Will they continue to climb or was this just a milestone bump? Will the anticipation of the new character Whisper drive sales even higher than last month? I cannot wait to find out! Previous BumbleKast #74: Archie Characters in IDW?